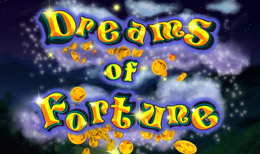 Dreams of Fortune is a 5-reel, 3-row online slot with 30 paylines. The game Theme is around the dreams of a snoozing shepherd tending a flock of sheep. The main game feature is a falling alarm clock that generates random wilds!